The full verdict: Easy comparisons can be made between Alan Turing and another Benedict Cumberbatch character. The genius intellect, the abrasive arrogance, the defensive social awkwardness. But, this is not Cumberbatch dusting off Sherlock for the big screen; one of his achievements is that five minutes into The Imitation Game all memories of Baker Street’s most famous resident have vanished. Writer Graham Moore and director Morten Tyldum frame Turing’s life story as a mystery Rory Kinnear’s plot device detective must unravel after he smells something fishy when Turing brushes off a burglary at his home. Suspecting that Turing may be a Soviet spy, not that uncommon in 1951 Britain, the detective’s investigation takes him into Turing’s past, his time at Bletchley Park leading the Enigma cracking team, and his outcast childhood at an exclusive school. Turing’s dark secret is not spying, rather homosexuality, still criminalised in the 40s and 50s and which saw his arrest for indecency. Although the 1951 framing scenes are awkwardly established, Moore’s script hits a confident stride when diving into Turing’s wartime experiences. Deftly deployed humour softens the abrasive character, particularly in scenes with Charles Dance’s increasingly exacerbated naval commander or when Turing attempts to win over his fellow, hostile code breakers with clumsy gestures of camaraderie (handing out apples, telling a joke). 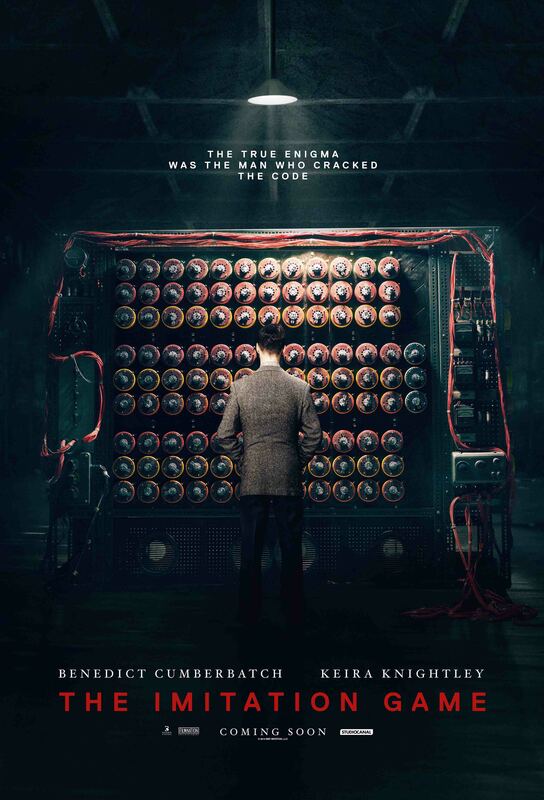 The Imitation Game also brings to urgent life the seemingly impossible task of breaking the Nazi Enigma machine – a fiendishly clever device that reset its message scrambling daily, giving the team only 18 hours from the first intercept to crack a puzzle with 159 million million possibilities before the clock restarted. And every passing second means more dead. Central to success was “Christopher”; a prototype computer named after a close childhood friend that Turing designed and built, inadvertently planting the seed of the modern computer age. As Turing’s life was a construct of one secret layered on top of another, Tyldum fittingly shoots the film as a thriller, employing the same steely blues and greys as seen in Tomas Alfredson’s Tinker, Taylor, Soldier, Spy. Particularly when Mark Strong, a veteran of that film, appears as a high level MI6 operative, creating along with the logical Turing what would become the espionage and covert operations of the Cold War. Bringing warmth and a light touch to the boy’s club is Knightley’s Joan Clarke, a double first mathematician who dazzles Turing with her mind and then her humanity, while Matthew Goode is watchable as ever as Turing’s chief detractor among the Bletchley team. The Imitation Game avoids heavy-handed sermonising on the irony of Turing’s post-war persecution after having helped defeat an aggressor whose MO was exterminating the outsider. Instead it subtly draws parallels between the codes Turing could break and the puzzles of everyday behaviour he was fascinated by but couldn’t crack. Nothing can soften the tragedy that characterised Turing’s later years, but this remains a testament to a singular, brilliant man and his extraordinary achievements.